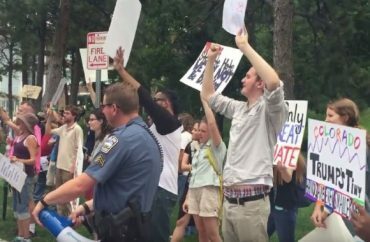 COLORADO SPRINGS, Colo. — Campaign appearances by Republican presidential nominee Donald Trump have incited violence, flag burnings, and rage-fueled debates, yet at a Trump pit stop at a Colorado campus on Friday protesters and Trump fans found something they could agree on — a dislike of Hillary Clinton. As chants of “Lock Her Up” were repeated by a row of Trump supporters outside the event – many anti-Trump protesters joined in. That wasn’t the only moment of Kumbaya between the two sides as Trump gave a speech inside the Gallogly Events Center at the University of Colorado Colorado Springs. Among the 100 or so protesters at the event, several held the U.S. flag, and in some cases, joined in on chants of “USA, USA, USA!” as well. Several anti-Trump protesters even called his visit to the campus a good thing – because it allowed the political process to unfold. This attitude stands in contrast to a letter signed by some 115 UCCS professors expressing disapproval of Trump’s visit on campus, stating they object to his rhetoric and accusing him of fueling fear of minorities. 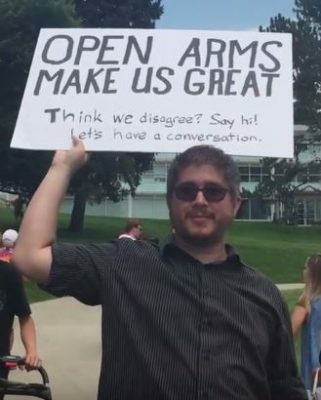 Anti-Trump protester Matthew Fernandez, holding a sign that read “Open Arms Makes Us Great” outside the event Friday, told The College Fix he believes he has more in common with Trump-supporters than differences. He added that although he disagrees with Trump’s policies, his visit was “a good thing” and “healthy,” and that the best way to let people know that they disagree with Trump’s message is to “let them hear him talk” rather than barring him from campus. There were a few shouting matches between demonstrators. As Trump spoke inside, protesters gathered on an outside lawn, holding signs that read “Trump: Stop the Hate,” “We Will Not Be Divided” and “Trump’s The Problem Not The Solution.” Nearby Trump supporters engaged in some verbal debates as a flank of police officers stood in the middle of the two groups. But the demonstration was capped off with a special moment as Trump rally attendees exited the building and embraced the long row of police officers with hugs and handshakes.